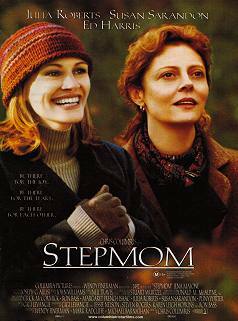 An unabashed weepy film, Stepmom is raised above the average by the commitment of the actors, including a Festivale favourite, character actor Ed Harris as the man balancing his loyalties to two women, his ex-wife (Susan Sarandon) and his future wife (Julia Roberts). Stepmom is set in the all too familiar environment of 'broken' homes, where children are torn between their separated parents and everyone is trying to make sense of fractured relationships. Stepmom lets us see the different sides of fractured families, and the pitfalls and difficulties of second-moms as Roberts battles snotty kids, an undermining ex-wife, and a boss who recognises her brilliance, but not the conflicting demands on her time. As the film progresses and the characters develop their new roles, and they come to grips with the new relationships, and their fates the two women give the audience a deep insight into the fears and hopes of moms and stepmoms. An interesting cast and script, although Harris' character is overshadowed by the relationship between the two women.